Posted on October 26, 2018 - By Fucosoft | Follow YouTube, Twitter to Get More Information. There are numerous messaging apps you will find on both Android and iPhone, enabling constant and instant communication with your family, friends and work colleagues. Some popular messaging apps include WhatsApp, WeChat, Viber, Line, Snapchat, etc. And now many social networking services also offer messaging services, such Facebook’s Messenger, along with Instagram’s Direct Message. We’ve discussed how to recover deleted Instagram Direct Messages on iPhone/Android. Here in this article, we’d like to explain how to perform Facebook message recovery on iPhone and Android. So here we go. Facebook Messenger app is currently used by 900 million people worldwide, which processes billions of messages per day. Chances are you’ve spent a lot of time on Facebook Messenger to stay connected with others, then it does happen you may wrongly deleted Facebook messages on your iPhone or Android device. It would be painful if the lost messages are with your loved one or contains important work details. Relax. Good news is that it is possible to get back your Facebook messages that you carelessly deleted. This page will show you how to recover deleted Facebook messages from archive or using third-party data recovery software. 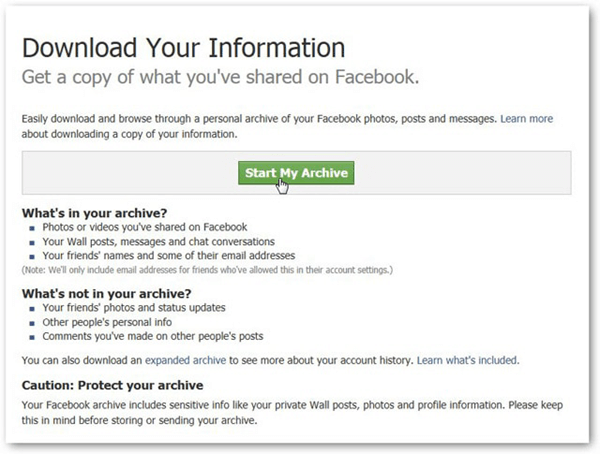 Rather than deleting messages you no longer want, Facebook allows you to archive them. Once you have archived the message, you can retrieve them at any time you want. It is quite easy to download a copy of your Facebook data including chat messages, photos, videos, contacts and other personal information. Open Facebook in your computer’s web browser and log in your Facebook account. Click the menu icon in the top-right corner of the Facebook page and tap “Settings” in the drop-down menu. Click the “General” tab and then click “Download a copy of your Facebook data” at the bottom of the page. On the new page that comes up, click “Start My Archive”, you will be prompted to enter your account password. After that, click “Download Archive” and it will download the Facebook data to your computer in a compressed format. Just unzip this downloaded archive and open the Index file in it. Then click on “Messages” to find your Facebook messages. To recover deleted messages from Facebook Messenger on iOS device, you can try Fucosoft iPhone Data Recovery. It allows you to scan your iPhone/iPad to retrieve deleted data from the device. Not only Facebook messages, the program can also recover deleted WhatsApp messages on iPhone as well as text messages, contacts, call history, photo, videos, notes, and much more. It is compatible with all iOS devices, including the latest iPhone XS/XS Max/XR, iPhone X, iPhone 8/7/6s/6 Plus, iPad that running on iOS 12/11. Download, install and run this Facebook Message Recovery for iPhone on your PC or Mac. Connect your iPhone to the computer with a USB cable. The software will detect the device automatically, just click “Next” to continue. Now select the specific file types you want to recover from iPhone, then tap “Scan” to begin the scanning process. Once the scanning has finished, you will be able to preview and select the Facebook messages you want to retrieve, then click “Recover”. For Android users, it is quite easy to get lost Facebook messages back using Fucosoft Android Data Recovery. The software is a cutting-edge tool to retrieve deleted messages from Facebook Messenger on Android phones. Also, it can help to restore WhatsApp chat history on Android, as well as SMS messages, contacts, call logs, photos, videos, documents, etc. All popular Android devices like Samsung Galaxy S9/Note 9, HTC U12+, Huawei Mate 20 Pro/P20, Google Pixel 3 XL, LG G7, Moto G6, OnePlus 6, Xiaomi, Oppo, etc are supported. Download, install and run this Facebook Message Recovery for Android on your PC or Mac. Enable USB Debugging on your Android phone and connect it to the computer with a USB cable. Wait for the program to detect your phone and choose the file types you intend to recover, then click “Next” to begin scanning. After the scan, preview and select Facebook messages from the displayed interface, then click “Recover” to retrieve them back. There you have it. In this article you have learned how to recover deleted Facebook messages from downloaded archive or using Fucosoft iPhone/Android Data Recovery software. If the above methods don’t work, you can try to contact the person you had the conversation with to retrieve the important Facebook messages.